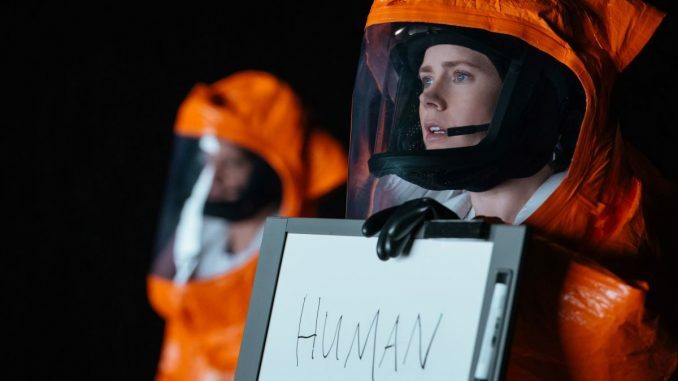 Amy Adams goes over her acting notes from the director. 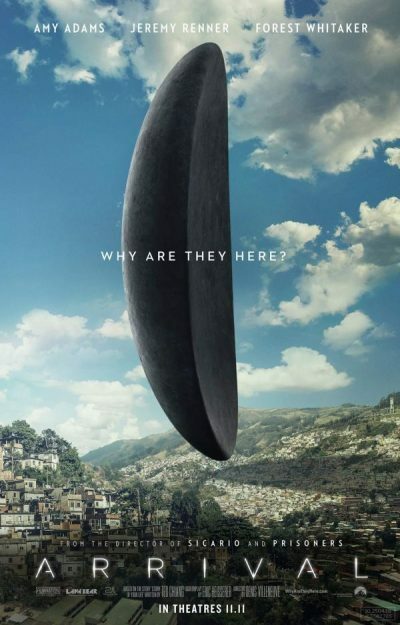 Was there another feature called Arrival last year? Perhaps the one nominated for eight Academy Awards? Y’know, the SF movie that was actually good? I fear we may have watched the wrong one, since the film we saw was a confusing and muddled mess. It was apparently – and here, I’m going off the Wikipedia page, since it’s a good deal more coherent than the script – based on the concept that learning an alien language will allow you suddenly to experience time in a non-linear fashion. Who knew it was that easy? A dozen alien spaceships show up, parking themselves all over the world. Linguist Louise Banks (Adams) is brought in by the government, to interface with the aliens, and try to figure out what they want and why they are here. Because, of course, this highly-advanced species, capable of traversing vast, interstellar distances in gigantic craft, are incapable of learning any of our languages. These ETs are clearly the equivalent of tourists, who think that showing up in a foreign country and yelling in English will get them understood. So, poor Louise has to try and figure out how to convert the literal smoke-signals which these heptapods use to communicate, into English. It’s not easy. Hell, one key plot element is the inability to tell whether the aliens mean “weapon” or “tool”. Kinda important, wouldn’t you think? I dunno, maybe she could ask for some clarification on this point? Then there’s also the explosives which get hidden away and sent up to the alien spacecraft, another thread which comes out of absolutely nowhere, whizzes across the storyline for no reason, and is then forgotten by all concerned – fortunately for humanity, including the aliens. It’s hard to tell how much of this is sloppy plotting, and how much deliberate obfuscation. For the film mimics the jumbled-up structure of the novel, Story of Your Life, by Ted Chiang, on which its screenplay is based, and that may be part of the problem – as we all know, what works on the page, does not necessarily do so on the screen. What positives there are, come mainly in the early going, where we see what appears to be a credible depiction of how things would unfold, if ever Earth is graced by visitors from somewhere else. The resulting numb paralysis and barely-controlled hysteria seems appropriate. Otherwise, let’s just say, I’m hoping Villeneuve has a much better script to work from, for Blade Runner 2049. But then, I’ve never generally been too convinced by these more optimistic depictions of first contact, which seem more about wish-fulfillment than anything. To me, the concept expounded here, little past that of Space Brothers descending from on high, to impart their knowledge and wisdom to us, has more in common with the hippy nonsense promoted by the UFO cults of George Adamski, Unarius or Raëlism. For history provides us with many, many examples of what happens when a less-developed civilization encounters their technological superiors. And it’s never good for the ones lower on the scientific totem-pole.